It is hard to pass up having a smartphone when you can talk to someone on the other side of the world in real-time through your device’s screen, store hundreds of gigabytes for easy access without using a hard drive, and trade stocks on your smartphone. This is made possible by technological advancements in smartphone software and hardware. Still, with all these innovations, mobile phone batteries have not improved. As each newly modeled smartphone is produced the battery life lacks. This is not all because of technology it is because we are using our phones for much more than the battery can handle. To see the extent to which this is true, we set out to investigate phone battery statistics in four major U.S cities; Boston, New York, Philadelphia, and Chicago. 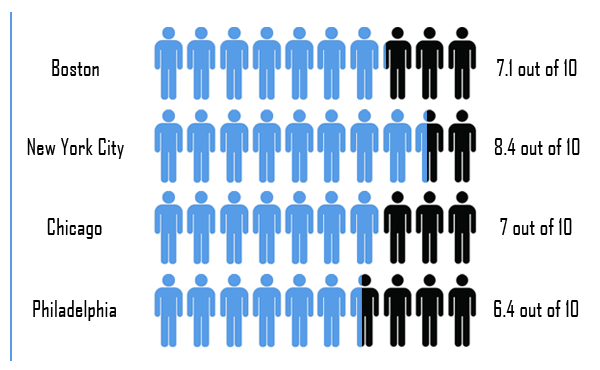 In each city we surveyed a total of 200 people on the street, in malls, or standing outside bars and nightclubs. Mobile users in NYC reported the highest frequency with an average of 2.6 charges per day. 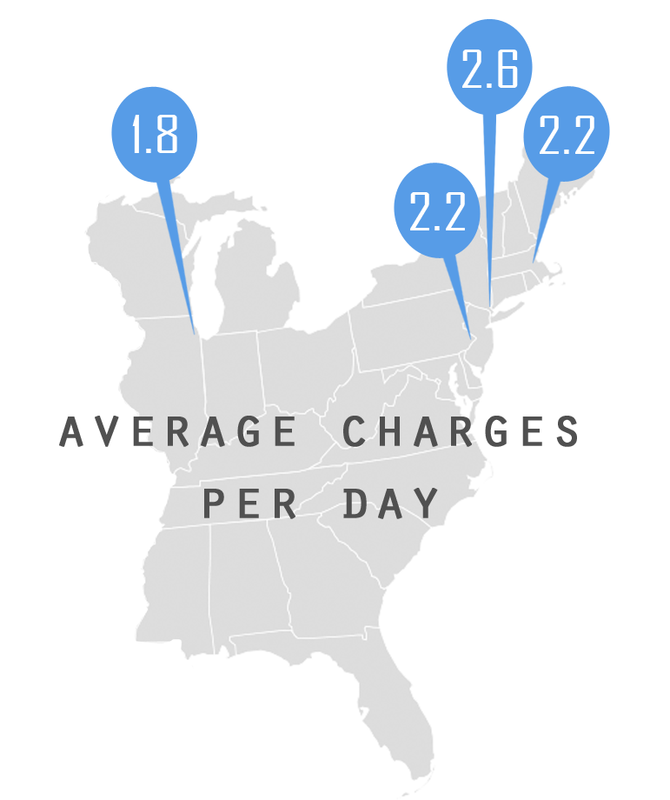 Those surveyed in Boston and Philly shared an average frequency of 2.2 charges per day, trailed by Chicago with 1.8 charges per day. A whopping 84 percent of respondents in New York City reported having experienced low battery anxiety compared to 71 percent, 70 percent and 64 percent in Boston, Chicago, and Philadelphia, respectively. Of those surveyed at 6pm, individual phone battery life averaged 40.94 percent overall. In Philly the average was 44.06 and in New York was 38.93 (Boston and Chicago fell in-between). Not surprisingly, individual phone battery life at 10pm decreased, averaging to 25.37 percent overall with an average of 27.52 percent in Philly and 23.13 percent in New York. In aggregate, 85 percent of respondents reported carrying no backup for their phone batteries. Only 11 percent of respondents reported carrying a spare charger and 4 percent an external battery. Content Updated on November 11th, 2015.